Earlier this year, we encouraged you to focus on a new kind of resolution for 2018: revitalizing your home! We understand that taking this on might sound like a major project, so we decided to create a series of blogs to guide you through the process. In Part 1, you completed a quick evaluation of your space using our handy checklist. Then we asked you to select the top three lowest ranking areas and begin making quick fixes that would have a big impact. You may have guessed that Part 2 would involve moving on to the next three areas by lowest ranking score. If you did, you are right! Take a look at your checklist and select items 4-6 and begin making quick fixes that will have a big impact in those areas. If you find that your Walls, Floors, or Ceilings are lacking, you’ll find the following suggestions very helpful! So without further ado, let’s talk Walls, Floors, & Ceilings. These areas create the foundation upon which everything else is placed. But before we do that, we must discuss Color Scheme and Flow! How do you feel about the colors in your space? Do you love them? Maybe just the one shade in the bathroom…ehh…not so much. Now that you really consider them, do they all feel like they were “safe” choices? If you need a fresh perspective, look at paint websites like Sherwin Williams and Benjamin Moore. Have an open mind to colors that you may never have considered. Remember, you can always test them in small doses. Looking at your space, consider the size and shape and how it connects to other rooms in your home. Do you want to make the room feel cozy or expansive? Think about what you will be doing in the room and how color can set that tone, whether it’s relaxing, stimulating or whimsical. How will the shades in one room transition to another? · Typically, the color or colors used here will set the stage for a room and more often than not, are muted and softer tones, though not necessarily light or pale. They will become the anchor colors and the size of the room will dictate the depth of the color. · If you are using darker colors, you can lighten the look with an area rug, window treatment or art for the walls. · The natural light coming through windows will always play a role in your color selection and must be carefully considered. · As an alternative for your walls, consider wallcoverings. There are some gorgeous patterns and textures that add a dimension to the room’s ambience that you cannot achieve any other way. And—it will last longer than paint. Don’t be nervous—we’ve come a long way since your grandmother’s wallpaper! It will come off easily if applied correctly and the updated colors and patters can truly be what will add the “wow” to your room. · If they are hardwood, are they in need of refinishing or simply a good buff and polish? Or are they beyond repair and need to be replaced? 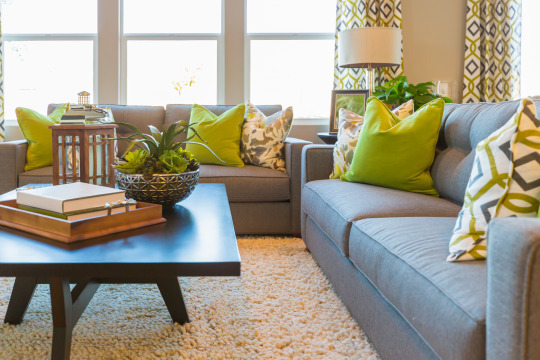 · If there is carpet, have you been keeping up with annual cleaning? If not, get them professionally cleaned or if it is close to 10 years or more in age maybe it’s time to replace it. Carpet is a textile and as such, it was never designed to wear and last as hardwood. And, if there has been an active family in the home, 10 years or more is a good benchmark for replacement. · If you have a tray ceiling or an unusually high ceiling, other colors are often used to accent or create warmth. You may even see some black ceilings where the room is so large that a more cozy effect is created by giving the illusion of a lower ceiling. · Take a look at restaurants or hotels for inspiration … you might be surprised at what you never noticed before. · And, then there is the use of wallcoverings on the ceiling—a great effect. Can create an atmosphere of luxury and solitude or great drama. In closing, we encourage you to think outrageously—at least THINK outrageously - and consider something you would normally have said no to before. You don’t have to do it if you don’t like it—but I have found many times, given the opportunity, many people warm up to outrageous and realize that’s what’s been missing in their décor! Stay tuned for Part 3 on Revitalizing Your Home and in the meantime, if you want to reach out to your local Decor&You decorator for a color consult or assistance with a specific project, we’d be happy to help!